Well here we are, it's almost time for the weekend, it's now just hours away. You can feel it, see it and sense the fact that the boss-man has lost control and the possibilities are endless for what you will do this weekend. If you're lucky enough [from a weather related point-of-view] to live here in So-Cal then you know this weekend is going to be superb [epic] for whatever out-door activity you decide to embark upon. With that in mind the chances are very good, that if you're reading these words that you'll be slurping down some juice this weekend, some looking for the serious and some just looking for the fairly quaff-able wine of the moment. But whatever it's you are looking for in the wine world, I hope you enjoy it fully, but please don't do the same old song and dance, explore something new and just say 'NO' to mass produced juice [aka, commodity wines]. 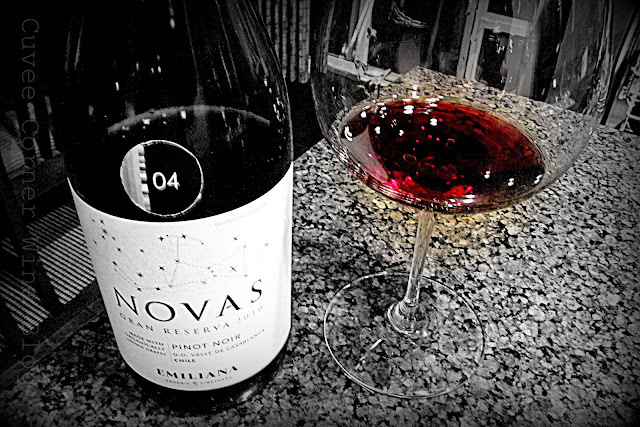 The 2010 Emilana Novas Pinot Noir is another wine [sample] I encountered during the Wines of Chile Blogger tasting, which did not come dressed to impress initially. I confess I chilled it a bit as requested, unsealed the screw cap and poured a 3 ounce pour about an hour before the 'live' tasting commenced. I'm not sure if this wine just didn't travel well or what the problem with it was, but it did NOT show well that evening. "Although several other bloggers were going gah-gah over it. It was dirty, murky and had some funky stewed aromas, which did not blow off that evening, aromas which made its dirty-shoe'd way to the wines overall flavor profile." 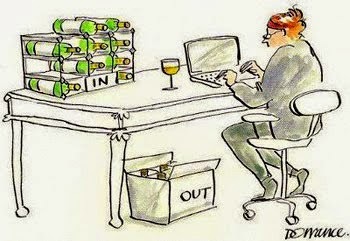 Now that said, I didn't pour the wine down the drain, like I know many other writers do. I took a different tact, instead I re-capped it and tucked it back into my cellar for a few days. Having just made an amazing whole roasted barbecue chicken [great pairing partner] and then seeing the poor little bottle of Emilana looking back at me, I decided to give this wine another go. I mean why not, it's already open, what the heck and I believe in second chances. So again I poured another 3 ounce pour in the glass you see in the picture above and wow, bang-bang this wine came out of its corner like Rocky against Apollo Creed. I was hit with boat-loads of baking spices, cranberry, ripe strawberry, rich wet-earth, wrapped around polished well integrated tannins, making for some nice QPR on a Pinot Noir with a SRP of $19. But the fact that this wine took three days to get its act together, that is really disappointing. Honestly folks, this wine did NOT show well that evening on any level and no I'm not exaggerating one bit. Even Mrs. Cuvee gave it a thumbs-down, she is no where near the snobby-grader that I can be at times. The Caveat: Perhaps, I didn't have the best bottle, perhaps I'm the only one whose wine was sick with bottle shock or is there another explanation, I confess to not knowing the answer. Even though this wine did make a remarkable turn-around, I still can't give it a good recommendation, my score on this wine is 84 points at best. Frankly folks, there is far easier game to hunt than this elusive Pinot Noir, which may ultimately disappoint the thirsty vino-sapien. The reviews of the wines I liked from this tasting are coming up next, so please stay tuned and remember folks until next time sip long and prosper cheers!